Rhizosecretion of functional recombinant proteins from in vitro cultured roots into the hydroponic medium offers an attractive technology to simplify down-stream purification procedures. Aim of the present study was the production and secretion of the antimicrobial peptide (AMP) ranalexin from Nicotiana tabacum hairy roots which were transformed by agroinfection. A His-tagged ranalexin was expressed under the control of CaMV 35S promoter and directed into the plant secretion pathway by fusing its N terminus to the ER signal peptide of calreticulin. The maximal accumulation of ranalexin in hairy root tissue after 20-25 days of culture accounted for about 3.36% of the total soluble protein. Secreted ranalexin reached a concentration of 0.28 mg/L in the medium on day 25. Extracellular ranalexin level could be increased to 1.64 mg/L by the addition of polyvinylpyrrolidone to the culture medium. The secreted ranalexin is active against Gram positive and Gram negative bacteria including strains which are multiresistant against antibiotics, such as methicillin-resistant Staphylococcus aureus MRSA, vancomycin-resistant Enterococcus VRE, Streptococcus pyogenes, Escherichia coli, Acinetobacter baumanii as well as clinical MRSA isolates. Our results demonstrate the usefulness of plant tissue cultures especially tobacco hairy roots as an alternative production system of ranalexin and other antimicrobial peptides. Nicotiana tabacum, Agrobacterium rhizogenes, Hairy roots, Antimicrobial peptide (AMP), Ranalexin, Rhizosecretion. AMPs: Antimicrobial Peptides; CFU: Colony Forming Unit; ER: Endoplasmic Reticulum; ESI-QTOF MS: Electrospray Ionization Quadrupole Time of Flight Mass Spectrometry; GFP: Green Fluorescent Protein; MIC: Minimum Inhibitory Concentration; MS-MS: Tandem Mass Spectrometry; PVP: Poly Vinyl Pyrrolidone; SDS: Sodium Dodecyl Sulphate; WP: Woody Plant. Several heterologous systems have been used to produce peptides of different size, 3D structures, and requiring different posttranslational modifications. Antimicrobial peptides (AMP) are small membrane-active peptides detected in many organisms (plants, animals) which function as natural defences against microbial pathogens. They can be useful as new antibiotics against multiresistant bacteria . AMPs can be obtained by chemical synthesis or by genetic engineering as recombinant proteins. More than 80% of AMPs have been produced in bacteria, the rest in yeasts . Recently, AMP genes have been transferred into plants mainly for crop improvement, since such transgenic plants show an enhanced resistance against microbial infections. Several natural cationic AMPs or their analogues have been synthesized in engineered transgenic plants like tomato, tobacco, rice, potato, cotton, banana and Arabidopsis [3-14]. Also the production of vaccines has been achieved in tobacco chloroplasts such as C4V3 (anti HIV virus) and EtMIC2 (against chicken coccidiosis) [15,16]. Despite various strategies that have been employed to enhance the expression of foreign genes in intact plants, the lack of protein stability and degradation in host tissues is believed to be a reason why many AMP-transformed plants have not shown a significant increase in disease resistance [17-19]. If plants are used to produce recombinant proteins, the extraction and purification of recombinant proteins, including AMPs, from plant tissues can be time-consuming; also yields are usually low which limit a large scale production of AMPs in plants. In order to overcome these problems, secretion based systems have been developed in which the products accumulate in the culture medium . As an alternative to whole plants, plant tissue cultures are increasingly used to produce valuable pharmaceutical proteins. In vitro cultures have several advantages like independence of field cultivation conditions, and the availability of cheap and simple media. In addition protein recovery is simplified in cultures especially from the medium due to the absence of contaminating proteins [20,21]. Hairy roots, which can easily be obtained from explants infected with Agrobacterium rhizogenes have been well established for the biosynthesis of valuable plant secondary metabolites as well as foreign proteins, e.g., monoclonal antibodies [22-24]. Due to their fast growth rates in hormone-free medium and their biochemical stability, hairy root cultures hold an immense potential for the pharmaceutical industry. The production of foreign proteins in plants cells and the secretion into the culture medium can be restricted by low levels of synthesis, degradation by hydrolytic and oxidative enzymes in the medium, or a combination of these two factors [24,25]. Thus, many factors need to be optimized to enhance the expression and synthesis levels and the stability of recombinant proteins in hairy root cultures. The objective in this study was the application of tobacco hairy roots for the synthesis of the recombinant AMP ranalexin. Ranalexin is a small cationic antimicrobial peptide (consisting of 20 amino acid residues: FLGGLIKIVPAMICAVTKKC), first isolated from the skin of the American bullfrog, Rana cateiana with a broad spectrum of antibacterial activities against human pathogens [26,27]. Recombinant ranalexin showed synergistic bactericidal activity when used in combination with polymyxin B or linezolid against multi-drug resistant bacteria [28-30]. Application of ranalexin in combination with lysostaphin in vivo has been shown to achieve the decolonization of MRSA strain S. aureus NRS384 . Furthermore, ranalexin shows potential advantages over the clinically used antibiotics. However, the limited availability of ranalexin from its natural sources stimulated the use of genetic engineering methods as alternatives. Up to now, we have successfully expressed bioactive recombinant mature ranalexin as a Thioredoxin (Trx) fusion peptide in E. coli, and recently in the yeast Pichia pastoris [29,30]. Mature leaves of Nicotiana tabacum were used for transformation. Escherichia coli (E. coli) strain DH5α was employed for routine plasmid amplification (subcloning) and Agrobacterium rhizogenes strain ATCC 15834 (kindly provided by Prof. Dr. W. Alfermann, Dusseldorf, Germany) for transformation of leaf discs. Destination vector pK7WG2D from GATEWAY™ was used as expression vector . Claforan (Sanofi Aventis), spectinomycin and kanamycin (Sigma-Aldrich® GmbH, Germany) were used to select recombinant hairy roots and to get rid of Agrobacteria after infection. For antibacterial activity standard strains were supplied by Medical Microbiology Laboratory, Hygiene Institute, Heidelberg University. Gram-positive bacteria (methicillin-resistant Staphylococcus aureus MRSA NCTC 10442, vancomycin-resistant Enterococcus VRE ATCC 31299 and Streptococcus pyogenes ATCC 12344) and Gram-negative bacteria (Escherichia coli ATCC 25922 and Acinetobacter baumanii ATCC BAA747) as well as clinical MRSA isolates were employed. Two primers Ranlx-SacI and Ranlx-HindIII-His-tag (obtained from Eurofins MWG Operon Ebersberg, Germany) were used to amplify the ranalexin gene from a 60-mer oligonucleotide of ranalexin by PCR . The secretory signal sequence of calreticulin (Z71395) was fused to the N terminal of ranalexin gene in order to target the recombinant AMP to the extracellular space of the hairy roots. The ranalexin nucleotide sequence (with or without the secretory signal sequence) were cloned into GATEWAY donor vector pDONR221 via the attB-attP(BP) recombination reaction according to the GATEWAY® Technology manual (Invitrogen; Darmstadt, Germany). Consequently, binary vectors were established by attL-attR (LR) reaction using pK7WG2D as a destination vector (Figure 1). The correct reading frame of ranalexin in all constructs was confirmed by PCR amplification and DNA sequencing (carried out by STARSEQ GmbH; Mainz, Germany). Bio Edit version 7 was used to analyze the sequences. Plant growth media were based on Murashige and Skoog and LIoyd [33,34]. Transformation of N. tabacum was performed using the leaf disc co-cultivation method as described by Horsch . Discs (0.5-1 cm in diameter) were prepared from 5 cm long green leaves of tobacco plants grown in the green house. More than 60 discs were incubated in 30 mL solution containing transformed A. rhizogenes for 30 min with gentle shaking. The leaf discs were then transferred onto filtered paper to remove the bacterial suspension and placed on WP plates for 2-3 d. For selection a maximum of 5-7 explants was placed upside down on WP plates containing antibiotics (250 mg/L claforan to eliminate A. rhizogenes, 100 mg/L kanamycin to select for transgenic plants) and kept in low light intensity until hairy root tips appeared. 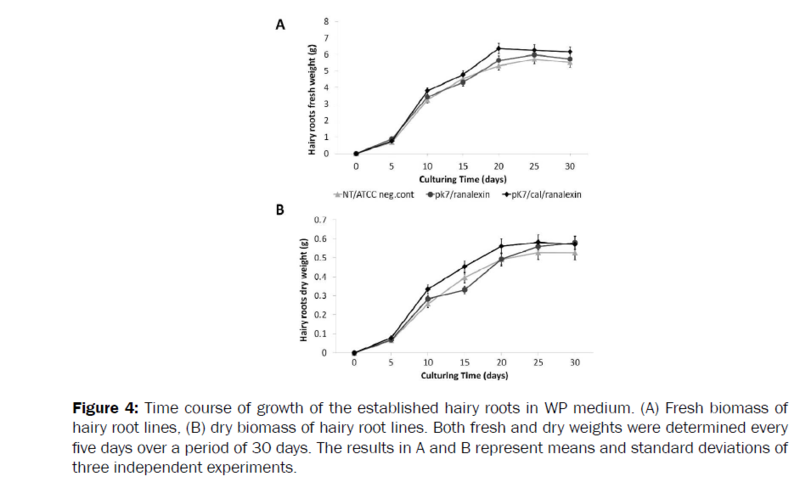 Approximately 0.25- 0.35 g fresh weight of 21 day old hairy roots of both wild type and transgenic roots were cultured in 250 mL Erlenmeyer flasks containing 50 mL WP medium over a period of 30 days. Wet and dry weight measurements were determined every 5 days. Hairy roots from each transgenic clone were harvested and dehydrated under vacuum for 5 min, and then their weight was determined. After drying the fresh roots in an incubator at 56ºC for 2-3 d the corresponding dry weight values were obtained. Fresh hairy root tissues were ground to a fine powder in liquid nitrogen with a pestle and mortar, and the total soluble protein was extracted in a buffer consisting of 50 mM NaH2PO4, 300 mM NaCl, 0.1% (w/v) Tween-20 and 5 mM phenylmethylsulfonyl fluoride PMSF; pH 8. About 1 g of hairy roots were extracted with 2 mL extraction buffer, vortexed and sonicated for 7 min. The supernatant was collected after centrifugation at 15,000 × g for 10 min at 4ºC. Proteins from the spent medium of the transformed and wild type hairy root cultures were precipitated with 58% ammonium sulphate at 4ºC. overnight. The precipitated proteins were collected by centrifugation (12,000 × g, 20 min and 4ºC). The pellet was resuspended in a buffer (50 mM NaH2PO4, 300 mM NaCl, pH 8) and desalted on Sephadex G25 columns (GE Healthcare, Germany). Stock solutions containing 1 mg/mL protein were stored at -80ºC until used for western blot analysis. Protein concentrations were determined by Bradford assay . Proteins were separated by Tricine-SDS-PAGE (12% tricine-sodium dodecyl sulfate-polyacrylamide electrophoresis) according to Schagger . For Western blot analysis the proteins were transferred onto nitrocellulose membranes at 50 V for 2 h. Ranalexin was detected using HisProbe-HRP (a nickel-activated derivative of horseradish peroxidase) according the manufacturer's instructions (Thermo Fisher Scientific, Germany) . The membrane was then documented by using the Bio-Rad Imaging System. Serial dilutions of recombinant ranalexin  were prepared for each blot as a positive control. The intensities of ranalexin bands were quantified using ImageJ 1.45s. Intracellular or extracellular proteins from 1 L spent medium were isolated first as mentioned above. Affinity chromatography using a His-resin column was applied to purify the recombinant His-tag ranalexin according to the manufacturer’s instruction (Protino® Ni-TED, Macherey-Nagel, Düren, Germany). Eluted proteins from different elution steps were separated by Tricine-SDSPAGE and silver stained. Later on, the purified ranalexin was desalted using G10 (GE Healthcare, Germany) and lyophilized by freeze drying. Fluorescence of 5 μg total protein extracted from transformed hairy roots and the wild type was loaded into 96 well transparent microplates in triplicate as described by Richards et al. . Measurements were performed with a Tecan safire reader (Männedorf, Switzerland) at an excitation wavelength of 488 nm with an emission of 535 nm. To determine ranalexin gene expression levels in different hairy roots transformants, total RNA from 12 d old hairy roots was isolated using Universal RNA Purification Kit (Roboklon). 1 μg of RNA from each sample was used as a template to synthesize the first cDNA strand according to the supplier’s instruction of ImProm-II™ Reverse Transcription System kit from Promega. (qRT)Ã¢ÂÂPCR was used to analyze the expression levels. Each quantitative PCR was performed in three replicates. The β-actin gene was used as reference. Relative expression levels of the ranalexin gene in pK7/ranlx and pK7/cal/ranlx lines were calculated with respect to the WT/HR. Both minimal inhibitory concentration (MIC) and minimal bactericidal concentration (MBC) were determined by broth microdilution as described previously, following the instructions of Clinical and Laboratories Standards Institute (CLSI) [30,41]. Polymyxin B and vancomycin were used as positive controls whereas the sterile water was used as a negative control. The constitutive pK7WG2D binary vector was used to express the ranalexin gene in tobacco hairy roots. To drive the ranalexin synthesis into the secretory pathway, the ranalexin gene was fused with the calreticulin (cal) signal sequence at its N-terminus. A vector containing the ranalexin gene without signal sequence was also constructed as a control. In addition, to simplify ranalexin purification, a 6-His tag was fused to the C-terminus of the ranalexin gene. Two constructs (pK7WG2D/ranlx and pK7WG2D/cal/ ranlx) were created by GATEWAY cloning which were under the control of CaMV 35S promoter (Figure 1). 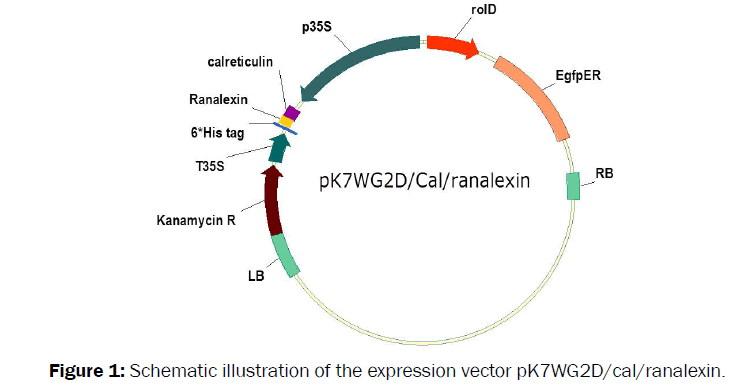 Figure 1: Schematic illustration of the expression vector pK7WG2D/cal/ranalexin. More than 30 hairy root clones were generated after leaf infection with A. rhizogenes ATCC15834 harbouring either pK7WG2D/ ranlx or pK7WG2D/cal/ranlx vector. As a negative control, a hairy root clone transformed with A. rhizogenes ATCC15834 (referred to WT/HR) alone without vector was also established. After kanamycin selection and hairy root appearance, GFP fluorescence (observed by microscopy) indicated a successful transformation of hairy root tips. PCR was performed with several pairs of primers (Table 1) to confirm the integration of the ranalexin gene into the genome. Gel electrophoresis of PCR products from transformed hairy roots showed the presence of the ranalexin gene in all the transgenic hairy roots but not in the WT/HR line. The integration of the signal sequence was evidenced by the different size of the detected band between pK7WG2D/ranlx and pK7WG2D/cal/ranlx transformed hairy roots when P35S, T35S primers are used. The VirC PCR product was only detected in A. rhizogenes samples but not in the transgenic hairy roots (Figure 2). The absence of virC PCR product in the transgenic cultures proved the absence of a contamination with Agrobacterium . The rol genes play an important role in hairy root induction . Therefore, the presence of a rolC PCR product in all transformed cultures proved the successful induction of hairy root formation. The fluorescence intensity of GFP in the transgenic hairy roots was used as an indicator of GFP protein synthesis, which helps to detect the differences in the GFP synthesis level between the established lines compared to the wild type (Figure 3A) . GFP intensity was measured in both extracellular and intracellular protein fractions (isolated from all hairy root lines) using a Tecan plate reader. The fluorescence intensity of intracellular soluble proteins isolated from the transgenic hairy roots (pK7WG2D/cal/ ranlx) was much higher than that of (pK7WG2D/ranlx) hairy root lines (Figure 3A). Figure 3: Expression of GFP in transformed hairy roots (A). Intracellular GFP fluorescence intensity was analysed for 5 ÃÂ¼g of total protein extracted from hairy roots lines; mean and standard deviations for three independent experiments are indicated for each cell line. (B) Comparison of the relative expression of the ranalexin gene between pK7WG2D/ranlx and pK7WG2D/cal/ranlx transformants. We extracted RNA from wild-type as well as transformed hairy roots and measured ranalexin gene transcript levels by quantitative reverse transcription (qRT)-PCR. Ranalexin gene transcripts were detected in both pK7/cal/ranlx and pK7/ranlx, but not in the WT/HR. Relative expression levels of the ranalexin gene in pK7/cal/ranlx lines were much higher than those of pK7/ ranlx lines (Figure 3B). Growth of pK7WG2D/ranlx, pK7WG2D/cal/ranlx lines and wild type hairy roots were investigated after 3-4 sub-cultures over 30 d. The pattern of dry and fresh growth was almost similar in all lines (Figure 4A and 4B) all clones exhibited a similar lag phase between day 1 and 5; a constant specific growth rate was detected between day 5 and 20. After day 20 the growth rate declined and the stationary phase was reached at day 25 to 30. The fresh biomass of pK7WG2D/cal/ranlx hairy root line (6.37 ± 0. 28 g/ flask) was significantly higher than that of pK7WG2D/ranlx line (5.64 ± 0.2 g/flask) at day 20. Figure 4: Time course of growth of the established hairy roots in WP medium. (A) Fresh biomass of hairy root lines, (B) dry biomass of hairy root lines. Both fresh and dry weights were determined every five days over a period of 30 days. The results in A and B represent means and standard deviations of three independent experiments. The expression levels of intracellular and extracellular recombinant ranalexin are documented in Figure 5. The yield of the intracellular ranalexin (pK7WG2D/ranlx) was relatively low and reached a maximum of 0.83% TSP (total soluble protein) after 20 days in culture. However, a higher expression level was detected in pK7WG2D/cal/ranlx cultures (about 3.3% TSP; (Figure 5A)). As expected, ranalexin was not secreted into the medium from pK7WG2D/ranlx cultures, whereas pK7WG2D/cal/ranlx cultures showed an increased secretion from day 10 to 25 with a maximum yield of about 0.28 μg/ mL (Figure 5B). These results correlated with the Western blot results (Figure 5C); a single band of ~ 3kDa was observed in both cell extracts from pK7WG2D/ ranlx and pK7WG2D/cal/ranlx which was absent in the cell extract of WT/HR wild type hairy roots. Extracellular proteins were collected from the spent medium as mentioned in Material and methods and the polyhistidine-tagged ranalexin was purified by affinity chromatography. Figure 5D presents the purification steps of recombinant ranalexin from the spent medium. His-tagged ranalexin eluted from the Ni-Ted column with 200 mM imidazole. 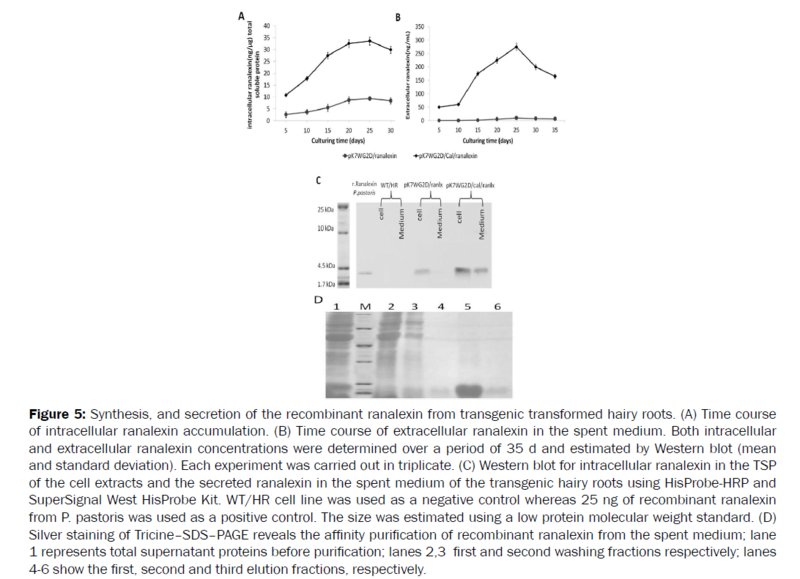 Figure 5: Synthesis, and secretion of the recombinant ranalexin from transgenic transformed hairy roots. (A) Time course of intracellular ranalexin accumulation. (B) Time course of extracellular ranalexin in the spent medium. Both intracellular and extracellular ranalexin concentrations were determined over a period of 35 d and estimated by Western blot (mean and standard deviation). Each experiment was carried out in triplicate. (C) Western blot for intracellular ranalexin in the TSP of the cell extracts and the secreted ranalexin in the spent medium of the transgenic hairy roots using HisProbe-HRP and SuperSignal West HisProbe Kit. WT/HR cell line was used as a negative control whereas 25 ng of recombinant ranalexin from P. pastoris was used as a positive control. The size was estimated using a low protein molecular weight standard. (D) Silver staining of TricineÃ¢ÂÂSDSÃ¢ÂÂPAGE reveals the affinity purification of recombinant ranalexin from the spent medium; lane 1 represents total supernatant proteins before purification; lanes 2,3 first and second washing fractions respectively; lanes 4-6 show the first, second and third elution fractions, respectively. The effect of both PVP and NaCl on ranalexin recovery was studied in pK7WG2D/cal/ranlx cultures. Although no effect was noticed on intracellular ranalexin, PVP significantly enhanced the secretion level of ranalexin to reach 1.68 μg/mL at day 25 which is about 6 times higher than the yield in untreated cultures (Figure 6A) without affecting the culture fresh biomass (Figure 6B). These results were confirmed by Western blot (Figure 6C). Surprisingly, NaCl addition to the culture medium did not stimulate the secretion of ranalexin even in higher concentration (data not shown). Figure 6: Effect of PVP on ranalexin synthesis and biomass production in hairy roots. (A) Yield of intracellular and secreted ranalexin from pK7WG2D/cal/ranlx transformed hairy roots after PVP was added to the medium. The amounts were determined by Western blot analysis on day 23. (B) The fresh biomass of pK7WG2D/cal/ranlx hairy roots with and without PVP. In A and B, each experiment was done in triplicate; means and standard deviation are shown. (C) Western blot of 100 ÃÂ¼l spent medium of pK7WG2D/cal/ranlx hairy roots culture with and without PVP addition. 20 ng of recombinant ranalexin from P. pastoris was used as a positive control. The size was estimated using a low protein molecular weight standard. The Western blot illustrates representative data of three experiments. Purified recombinant ranalexin was desalted and tested in vitro against several standard and clinical pathogens (Table 2). Recombinant ranalexin was biologically active and exhibited a strong antibacterial activity towards all tested bacteria including multiresistant Staphylococcus aureus MRSA, vancomycin-resistant Enterococcus VRE, Streptococcus pyogenes, Escherichia coli, Acinetobacter baumanii as well as clinical MRSA isolates with MIC values between 8 and 64 μg/mL. Furthermore, minimal bactericidal activities (MBCs) of recombinant ranalexin were two-fold higher than their corresponding MIC values against all strains except of Streptococcus pyogenes. PVP and NaCl treatment had no influence on the antimicrobial activity of ranalexin. Hairy root cultures have been employed to produce a wide range of valuable recombinant proteins for diagnostic and therapeutic use . Compared with animal cell culture systems, the use of plant cells reduces the contamination risk with animalderived pathogens in a simple and relatively cheap medium. Product recovery may be facilitated when protein are secreted into the culture medium . To our knowledge, ranalexin has not yet been expressed in plant tissue culture or even in transgenic plants. However, several reports on the expression of other AMPs in genetically modified plants -either constitutively or by induction after pathogen invasion- showed an increase of resistance against pathogen infections [5,8]. In our study two hairy root lines have been established harbouring the binary vector either with the ranalexin gene alone or with ranalexin fused to ER signal peptide at its N- terminal. RT-PCR data indicated a higher expression level of the ranalexin gene in roots transformed with pK7/cal/ranlx. Although gene expression does often not correlate with the protein synthesis; our results showed that the production level of recombinant ranalexin in the presence of the signal peptide was much higher (4 fold higher in TSP) than the corresponding transformants lacking the signal sequence. This enhancement of the production level is in good agreement with other studies [14,45]. Some AMPs produced in plants, particularly cecropin B, were degraded by endogenous peptidases, which may be responsible for contradictory effects on disease resistance in plants [18,19]. Targeting ranalexin to the endoplasmic reticulum (ER) apparently not only improved accumulation levels (due to the low hydrolysis activity in the lumen) but also supported the correct folding, as well as the secretion into the culture medium [17,46]. It is also important to mention, that the expression of AMPs in earlier studies was usually under the control of a strong constitutive CaMV 35S promoter or its derivatives which seems to be responsible for insufficient AMP levels in plant by causing transgene silencing . Yi et al., has also reported that multiple insertions caused by CaMV 35S promoter may have negative consequences, which suggest an ability to enhance the expression level of ranalexin from hairy root culture by changing the promoter in future studies . Moreover, differences in the ionic forces between the highly positively charged ranalexin –(fused with 6 His tag- with a pI value of 9.39)- may enhance its binding to the cell wall and limit its secretion into the medium as reported in previous studies [49,50]. However, adding sodium chloride to the culture medium had no influence on the secretion of ranalexin (data not shown). The extracellular ranalexin level reached in transformed pK7WG2D/cal/ranlx was relatively low if compared with secreted antibodies from tobacco hairy roots [44,51,52]. The decrease of extracellular ranalexin level after 25 day in culture (Figure 5B) was similar to many other extracellular proteins that have been produced previously in tobacco hairy roots [17,51,53,54]. The reason for this loss in a sterile medium is still unclear, but could be due the changes in the culture medium at the end of the exponential phase of growth, which experience a significant increase in medium proteases as well as the surface adsorption to culture flasks . A significant enhancement (6.1 fold) in the secretion level of ranalexin from the hairy root culture was observed after adding PVP as a stabilizing agent, possibly because it can interfere with ranalexin adsorption by modifying the surface environment which may prevent its denaturation and adherence to surfaces in the culture vessel [17,56,57]. Also other extracellular proteins have been stabilized by PVP [51,52,58]. The activity of intracellular and extracellular ranalexin against several human bacterial strains indicated no change in its activity even after adding PVP to the culture media as documented in Table 2. These results are in agreement with our previous study with secretory ranalexin obtained from recombinant Pichia pastoris . Biosynthesis of ranalexin in hairy roots and its secretion into the medium may be an interesting alternative for its mass production in bioreactor systems. However, several features need to be optimized to obtain higher yields than reported in this study. Since recombinant ranalexin is bactericidal against several Gram-positive and Gram-negative multiresistant bacteria, it might be an interesting candidate as an emergency drug in case of septicemia when a quick chemotherapy is required or for topical applications. Ranalexin alone or in combination with other antibiotics need to be evaluated in clinical studies to prove its efficacy in a clinical context. Zasloff M. Antimicrobial peptides of multicellular organisms. Nature. (2002);45:389–395. Li Y and Chen Z. RAPD: a database of recombinantly-produced antimicrobial peptides. FEMS MicrobiolLett. 2008;289:26-29. Alan AR, et al. Expression of a magainin-type antimicrobial peptide gene (MSI-99) in tomato enhances resistance to bacterial speck disease. Plant Cell Rep. 2004;22:388-396. Jaynes JM, et al. Expression of a cecropin B lytic peptide analog in transgenic tobacco confers enhanced resistance to bacterial wilt caused by Pseudomonas solanacearum. Plant Science.993;89:43-53. Huang Y, et al. Expression of an Engineered Cecropin Gene Cassette in Transgenic Tobacco Plants Confers Disease Resistance to Pseudomonas syringaepv. tabaci. Phytopathology. 997;87:494-499. DeGray G, et al. Expression of an antimicrobial peptide via the chloroplast genome to control phytopathogenic bacteria and fungi. Plant Physiol.200;27:852-862. Yevtushenko DP, et al. Pathogen-induced expression of a cecropin A-melittin antimicrobial peptide gene confers antifungal resistance in transgenic tobacco. J Exp Bot.2005;56:685-695. 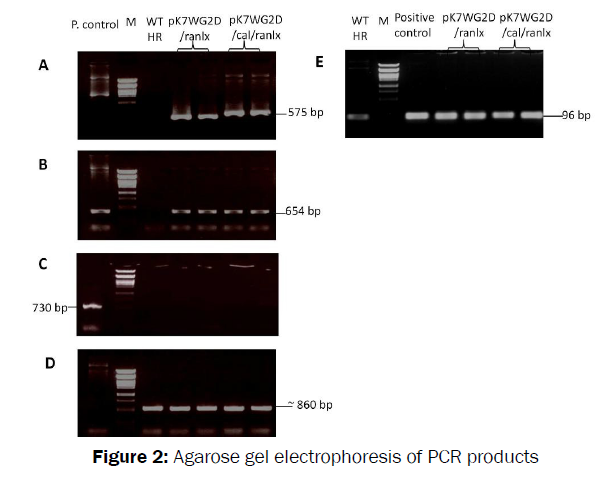 Yevtushenko DP and Misra S. Comparison of pathogen-induced expression and efficacy of two amphibian antimicrobial peptides, MsrA2 and temporin A, for engineering wide-spectrum disease resistance in tobacco. Plant Biotechnol J. 2007;5:720-734. Coca M, et al. Enhanced resistance to the rice blast fungus Magnaporthegrisea conferred by expression of a cecropinA gene in transgenic rice. Planta. 2006;223:392-406. Sharma A, et al. Transgenic expression of cecropin B, an antibacterial peptide from Bombyxmori, confers enhanced resistance to bacterial leaf blight in rice. FEBS letters.2000;484:7-. Gao AG, et al. Fungal pathogen protection in potato by expression of a plant defensin peptide. Nat Biotechnol. 2000;8:307-30. Rajasekaran K, et al. Disease resistance conferred by the expression of a gene encoding a synthetic peptide in transgenic cotton (Gossypiumhirsutum L.) plants. Plant Biotechnol J.2005;3:545-554. Chakrabarti A, et al. MSI99, a magainin analogue, imparts enhanced disease resistance in transgenic tobacco and banana. Planta. 2003;26:587-596. Wu T, et al. Expression of antimicrobial peptides thanatin(S) in transgenic Arabidopsis enhanced resistance to phytopathogenic fungi and bacteria. Gene.203;527:235-242. Rubio Infante N, et al. (202) A chloroplast-derived C4V3 polypeptide from the human immunodeficiency virus (HIV) is orally immunogenic in mice. Plant molecular biology 78:337-349. Sathish K, Sriraman R, Subramanian BM, Rao NH, Balaji K, et al. Plant expressed EtMIC2 is an effective immunogen in conferring protection against chicken coccidiosis. Vaccine.20;29:9209208. Doran PM. Foreign protein degradation and instability in plants and plant tissue cultures. Trends Biotechnol.2006;24:426-432. Hightower R, et al. The expression of cecropin peptide in transgenic tobacco does not confer resistance to Pseudomonas syringaepvtabaci. Plant Cell Reports.994;3:295-299. Florack D, et al. Expression of giant silkmothcecropin B genes in tobacco. Transgenic Res.995;4:32-4. Doran PM. Foreign protein production in plant tissue cultures. CurrOpinBiotechnol.2000;11:99-204. Hellwig S, et al. Plant cell cultures for the production of recombinant proteins. Nat Biotechnol. 2004;22:45-422. Wink M, et al. Sustainable bioproduction of phytochemicals by plant in vitro cultures: anticancer agents. Plant Genetic Resources.2005;3:90-00. Fu CX, et al. A comparison between hairy root cultures and wild plants of Saussureainvolucrata in phenylpropanoids production. Plant Cell Rep.2006;24:750-754. Sharp JM and Doran PM. Strategies for enhancing monoclonal antibody accumulation in plant cell and organ cultures. BiotechnolProg.200;7:979-992. Clark DP, et al.Ranalexin. A novel antimicrobial peptide from bullfrog (Ranacatesbeiana) skin, structurally related to the bacterial antibiotic, polymyxin. J Biol Chem.994;269:0849-0855. Giacometti A, et5 al. In vitro activities of membrane-active peptides against gram-positive and gram-negative aerobic bacteria. Antimicrob Agents Chemother.998;42:3320-3324. Desbois AP, et al. MRSA decolonization of cotton rat nares by a combination treatment comprising lysostaphin and the antimicrobial peptide ranalexin. J AntimicrobChemother.203;68:2569-2575. Aleinein RA, Hamoud R, Schäfer H, Wink M (203) Molecular cloning and expression of ranalexin, a bioactive antimicrobial peptide from Ranacatesbeiana in Escherichia coli and assessments of its biological activities. ApplMicrobiolBiotechnol 97: 3535-3543. Aleinein RA, Schäfer H, Wink M Secretory ranalexin produced in recombinant Pichiapastoris exhibits additive or synergistic bactericidal activity when used in combination with polymyxin B or linezolid against multi-drug resistant bacteria. Biotechnology journal. 204;9:0-9. Karimi M, et al. GATEWAY vectors for Agrobacterium-mediated plant transformation. Trends Plant Sci.2002;7:93-95. Mattanovich D, Rüker F, Machado AC, Laimer M, Regner F, et al. (989) Efficient transformation of Agrobacterium spp. by electroporation. Nucleic Acids Res 7: 6747. Murashige T and Skoog F.A revised medium for rapid growth and bio assays with tobacco tissue cultures. PhysiologiaPlantarum. 962;5:473-497. Lloyd GB. Commercially feasible micropropagation of mountain laurel, Kalmia latifolia, by use of shoot-tip culture. Int Plant Prop Soc. 980;30:42-427. Horsch RB, et al. A simple and general method for transferring genes into plants. Science. 985;227:229-23. Stewart CN and Via LE A rapid CTAB DNA isolation technique useful for RAPD fingerprinting and other PCR applications. BioTechniques.993;4:748-750. Bradford MM. A rapid and sensitive method for the quantitation of microgram quantities of protein utilizing the principle of protein-dye binding. Analytical biochemistry.976;72:248-254. Schägger H. Tricine-SDS-PAGE. Nat Protoc.2006;:6-22. Segawa H, et al. Reconstitution of GDP-mannose transport activity with purified Leishmania LPG2 protein in liposomes. J Biol Chem.2005;280:2028-2035. Richards HA, Halfhill MD, Millwood RJ, Stewart CN Jr Quantitative GFP fluorescence as an indicator of recombinant protein synthesis in transgenic plants. Plant Cell Rep.2003;22:7-2. CLSI. Clinical and laboratory Standards Institute. Performance standards of antimicrobial susceptibility testing; fifteenth information supplement. Wayne, PA: Document M00-S5. 2005. Zayed R, Wink M (2004) Induction of tropane alkaloid formation in transformed root cultures of Brugmansiasuaveolens (Solanaceae). Z Naturforsch C 59: 863-867. Palazon J, et al. Effect of rol genes from Agrobacterium rhizogenes TL-DNA on nicotine production in tobacco root cultures. Plant PhysiolBiochem. 997;35:55-62. Georgiev MI, Pavlov AI, BleyT Hairy root type plant in vitro systems as sources of bioactive substances. ApplMicrobiolBiotechnol.2007;74:75-85. Nadal A, et al. Constitutive expression of transgenes encoding derivatives of the synthetic antimicrobial peptide BP00: impact on rice host plant fitness. BMC plant biology. 202;2:59. Benchabane M, et al. Preventing unintended proteolysis in plant protein biofactories. Plant biotechnology journal. 2008;6:633-648. Matzke MA and MatzkeA How and Why Do Plants Inactivate Homologous (Trans)genes?. Plant Physiol.995;07:679-685. Yi JY, et al. Plant defense gene promoter enhances the reliability of shiva- gene-induced resistance to soft rot disease in potato. Planta.2004;220:65-7. James EA, et al. Production and characterization of biologically active human GM-CSF secreted by genetically modified plant cells. Protein ExprPurif.2000;9:3-38. Pham NB, Schäfer H, Wink M. Production and secretion of recombinant thaumatin in tobacco hairy root cultures. Biotechnol J.202;7:537-545. Martínez C, Petruccelli S, Giulietti AM, Alvarez MA Expression of the antibody 4D9 in Nicotianatabacum hairy roots. Electron J Biotechnol. 2005;8:70-76. Wongsamuth R and Doran PM . Production of monoclonal antibodies by tobacco hairy roots. BiotechnolBioeng.997;54:40-45. Soderquist RG and Lee JM Enhanced production of recombinant proteins from plant cells by the application of osmotic stress and protein stabilization. Plant Cell Rep.2005;24:27-32. Kumar GB, et al. Secretion of hepatitis B surface antigen in transformed tobacco cell suspension cultures. BiotechnolLett.2005;27:927-932. Doran PM. Loss of secreted antibody from transgenic plant tissue cultures due to surface adsorption. J Biotechnol.2006;22:39-54. Shadwick FS and Doran PM. Foreign Protein Expression Using Plant Cell Suspension and Hairy Root Cultures. Molecular Farming: Wiley-VCH Verlag GmbH & Co. KGaA. 2005;pp:3-36. LaCount W, et al. The effect of polyvinylpyrrolidone (PVP) on the heavy chain monoclonal antibody production from plant suspension cultures. Biotechnology Letters. 997;9:93-96. Magnuson NS, et al. Enhanced recovery of a secreted mammalian protein from suspension culture of genetically modified tobacco cells. Protein ExprPurif.996;7:220-228.